Barbara Bush, the former First Lady of the United States of America, has died at the age of 92. She was born Barbara Pierce on June 8th, 1925 and passed away on April 17, 2018. She was the wife of George H. W. Bush, the 41st President of the United States, and served as the First Lady of the United States from 1989 to 1993. When her husband was Vice-President to Ronald Reagan she served as the Second Lady of the United States from 1981 to 1989. She was also the mother of George W. Bush, the 43rd President, and Jeb Bush, the 43rd Governor of Florida. Mrs. Bush was born in Manhattan. She met her husband, George Herbert Walker Bush, at age 16. They married in Rye, New York, in 1945. George Bush was on leave during his deployment as a Naval officer in World War II when they married. The Bush family had six children together; George, Robin, Jeb, Neil, Marvin, and Dorothy. They have 14 grandchildren and seven great-grandchildren. As First Lady Barbara Bush she founded the Barbara Bush Foundation for Family Literacy. Barbara was the daughter of Pauline (born: Robinson) and Marvin Pierce, who was president of McCall Corporation, publisher of the popular women's magazines Redbook and McCall's. She came from a family of 4 children with two elder siblings; Martha and James and a younger brother named Scott. She was well known for her strong Christian faith and prayers. Bush suffered from chronic obstructive pulmonary disease (COPD), congestive heart failure, and Graves' disease. In April 2018, the Bush family released a statement that Mrs. Bush would no longer seek medical treatment and had instead chosen the option of "comfort care". 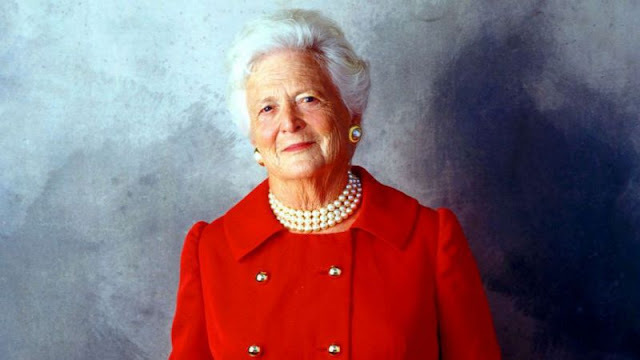 Bush died in her Houston home of complications from COPD at the age of 92 on April 17, 2018. President Donald Trump said:"As a wife, mother, grandmother, military spouse, and former First Lady, Mrs. Bush was an advocate of the American family. Amongst her greatest achievements was recognizing the importance of literacy as a fundamental family value that requires nurturing and protection. She will be long remembered for her strong devotion to country and family, both of which she served unfailingly well. The President and First Lady’s thoughts and prayers are with the family and friends of Mrs. Bush," the White House statement says. The funeral for Barbara Bush will be held on Saturday at 11am at St. Martin's Episcopal Church in Houston. She will be at the George Bush Presidential Library.